It was supposed to be a simple job. A short hyperspace jump, a remote planet, and no blaster fire whatsoever. But simple jobs never stay simple, not on the edge of the Empire. Take your Star Wars: Edge of the Empire campaign to the next level with the Edge of the Empire Game Master's Kit. Great stories have great villains, and the Nemesis rules and advice contained within are specifically designed to provide memorable antagonists for your Star Wars stories. The kit also contains a brand new adventure, new rules and advice for GMs, and a deluxe Game Master's Screen that places the most commonly-referenced rules close at hand. This product includes a 32 page book and a 4-panel Game Master's screen. 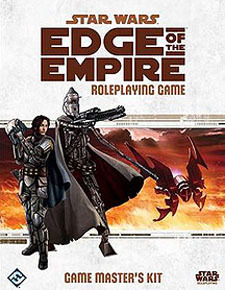 A copy of the Edge of the Empire Roleplaying Game core rulebook is required to use this supplement.